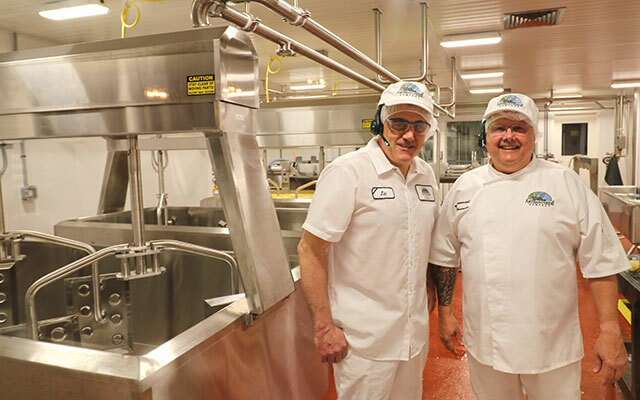 Master Cheesemakers Mike Brunnenstuhl and Jim Demeter will give visitors a first hand view of how cheeses are made. A large viewing window overlooks the vats of fresh milk being stirred into curds. Then follow the cheeses as they age in the temperature and humidity controlled rooms to develop the unique flavors of artisan cheeses. Brief tours of the lower level cheese caves will be available on request. Please check back for special wine and cheese pairing classes or exploring the history of Wisconsin cheesemaking later this summer.